Robert Kraft attends the Super Bowl 53 pregame at Mercedes-Benz Stadium on Feb. 3, 2019 in Atlanta, Georgia. 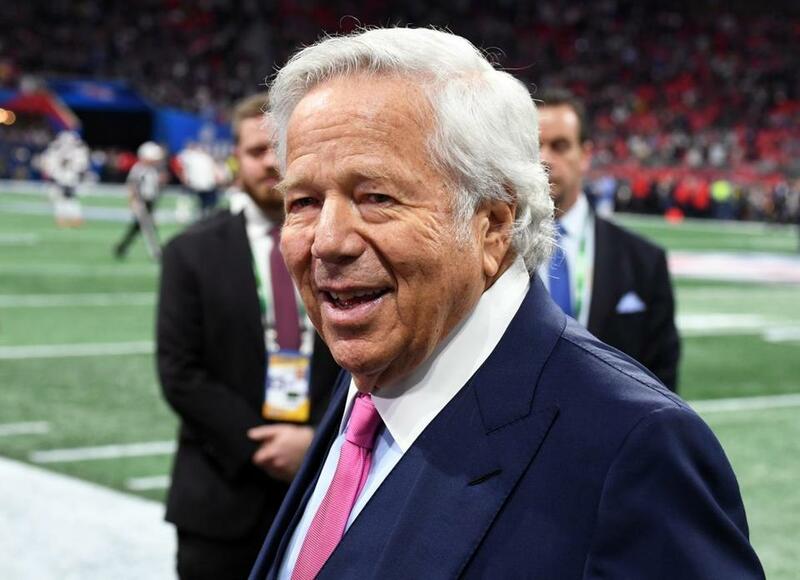 Robert Kraft was spotted at at least one pre-Oscars party in Los Angeles on Saturday, just a day after news broke that he will be charged with soliciting prostitutes at a massage parlor in Jupiter, Fla. But the Patriots owner was a no-show Sunday at Elton John’s Academy Awards viewing party — an event he hasn’t missed in years. TMZ reported that Kraft was seen leaving a bash Saturday hosted by billionaire and media mogul Barry Diller in Beverly Hills. The pre-Oscars fete also drew pop superstar Katy Perry, director Ron Howard, “CBS This Morning” anchor Gayle King, and Amazon CEO Jeff Bezos, according to the Daily Mail. On Friday, Kraft attended another star-studded soiree, that one thrown by billionaire Ronald Perelman, according to Page Six. On Sunday, however, Kraft, 77, avoided the spotlight. He’s a longtime friend and fan of John’s and donates money to the Elton John AIDS Foundation, which is the beneficiary of the annual Oscars bash. Sunday’s event, hosted by John and his husband, David Furnish, raised $6.3 million. Last year, Kraft attended the party with girlfriend Ricki Lander, who just months earlier had given birth to a daughter. Kraft has denied paternity. The Palm Beach County state attorney’s office charged Kraft on Monday with two first-degree misdemeanor counts of soliciting another to commit prostitution. He is one of more than 200 individuals expected to be charged in a sting operation that allegedly included several Florida massage parlors, police say.